The works of Traci Higginbotham will be on exhibit in “A Conversation with Color” at Wilmington College’s Harcum Art Gallery. 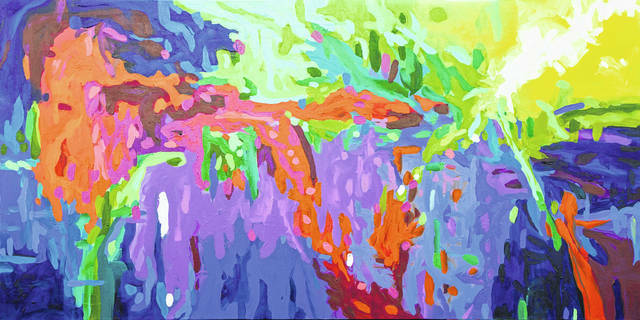 WILMINGTON — Traci Higginbotham’s “awe of Mother Nature’s palette” informs her work as she seeks to “awaken” her viewers’ emotions through bright colors and imagery in her abstract art. The Charleston, West Virginia, artist will present an exhibit of her works, titled “A Conversation with Color,” at Wilmington College’s Harcum Art Gallery Oct. 24 through Dec. 7. An opening reception is planned for Oct. 24 from 6 to 8 p.m.
Gallery hours include weekdays 9 a.m. to 5 p.m., and by special appointment arranged by curator Hal Shunk, professor of art. Higginbotham spent her first 10 years in nearby Centerville before moving to West Virginia, where she quickly recognized the beauty of the mountains and majestic sunsets. She entered an art program for gifted students in elementary school and continued studying art through high school. Soon, she was recommended for a job in one of the state’s top art galleries, where, surrounded by local and regional artists, her style evolved as a painter. She graduated from the University of Charleston in 1997 with degrees in interior design and arts administration. Higginbotham is owner/operator of the Art Emporium in downtown Charleston, where she not only focuses on her own art but also works closely with many emerging artists. She has participated in numerous juried exhibitions and gallery shows, and is a juried member of both Tamarack and Allied Artists of West Virginia. While she has pursued drawing and paper collage, her real love is painting and her large canvasses featuring brilliant color choices have become highly recognizable by many in the Mountain State. “I am inspired by the things I see,” she said, noting it may be the colors in a sunset, reflections on water or even the combination of hues seen in a spot of rust or fabric pattern. “I start applying paint to the canvas and listen to the color as it guides me, challenges and pushes me,” she added. “Although most of my viewers see my paintings as free flowing, I often start with detailed structure and a very specific composition in mind by sketching on the canvas.